Cardiovascular disease is the most common and yet one of the most preventable causes of death. Moreover the risk of premature disease varies by ethnic group. Relative to subjects of Caucasian origin, Afro-Caribbeans and people of African descent have high incidence of stroke and end-stage renal failure whereas coronary heart disease is less common. On the other hand, South Asians (from the Indian sub-continent and from East Africa) have a higher incidence of CHD. Although different genetic make-ups might, in part, explain such differences, environmental and modifiable factors relating to diet and life-style play an important role. Just over 3 million people in England & Wales belong to ethnic minorities. These groups are concentrated around and in inner cities. Morbidity and mortality from vascular disease and utilisation of health care resources are likely to be high in such areas and the strategies may not apply to these groups for which more tailored preventive strategies may be needed. We carried out a population-based survey in South London to estimate the prevalence of the major cardiovascular risk factors in both men and women of different ethnic background. Approximately 1,600 men and women aged 40-59 years of three ethnic groups (white, South Asian and of African origin) living in Wandsworth, a borough of South London were screened between 1994 and 1996 for cardiovascular risk factors. Biological and DNA bank were set up. Hypertension and diabetes are raised 2-to-3 fold in South Asians, Caribbeans and West Africans. Whilst the detection, management and control of hypertension has improved overall when compared to past national levels, there are still differences between ethnic groups. Obesity is above the national health targets in all ethnic groups, particularly in women of African descent. Important dietary differences exist in South Asians that may contribute to their increased coronary risk, like lower plasma levels of vitamin C and raised plasma levels of homocysteine. The latter, however, is mainly raised in South Asian Hindus, but not in Muslims. There is an independent effect of ethnicity on hormone replacement therapy use. Women of South Asian origin, who are at highest risk of cardiovascular disease and osteoporosis, are least likely to be hormone users, even after a hysterectomy. The new American Diabetic Association definition of diabetes fails to identify subjects with Impaired Glucose Tolerance, particularly among South Asians, with important implications for prevention and treatment, since subjects with Impaired Glucose Tolerance but normal Impaired Fasting Glucose are at greater risk of coronary heart disease. Blood pressure, salt intake and ethnic origin are independent predictors of urinary calcium excretion in an unselected population. These relationships are unlikely to be the result of differences in calcium intake or intestinal calcium absorption as they are seen also after an overnight fast, suggesting that they may reflect differences in renal tubular handling. The estimated effects of either blood pressure or sodium intake on urinary calcium, sustained over many years, may be associated with significant effects on bone calcium content. The regular users of alternative medicines (such as cod liver oil, primrose oil, vitamin supplements, garlic tablets etc.) in London are more likely to be women, of African origin, and of higher socio-economic background. Given the lack of evidence of efficacy and safety of the regular use of these alternative medicines, it is important to understand the cultural differences in values and beliefs of traditional medicine that may underlie these findings. The study provides estimates of the frequency distribution of the ACE I/D polymorphism in whites, in people of African origin and of South Asian origin. The results highlight the potential importance of gender-dependent interactions between genetic background and expression of hypertensive phenotype. There was a highly significant association between the D allele and hypertension in women [OR=2.54; 95%CI 1.38-4.65; P=0.003] but not in men [0.79; 0.36-1.72] of African origin. The 594M genetic variant of the b sub-unit of the sodium channel may contribute to high blood pressure in black people of African origin whereas the G442V polymorphism is unlikely to influence blood pressure in this population. The study shows, for the first time, a high frequency of the 825T allele of the G-protein b3 sub-unit in black people and it provides evidence that the T allele may be a susceptibility factor for the development of hypertension in blacks. Given the high frequency of the T allele, even a two-fold increased risk of hypertension amongst the carriers of the T allele might account for 44% of the cases of hypertension in blacks. Low fibrinogen levels in people of African origin may partly explain their lower risk of ischaemic heart disease. Allelic variations at the fibrinogen locus do not explain the fibrinogen difference, but the lack of complete allelic association between genotypes in people of African origin could be exploited to determine which gene controls fibrinogen levels. A single common polymorphism in the LPL gene is unlikely to account for the differences in fasting serum Tg in populations of different ethnic background. The importance of the differences in frequencies and the mechanism(s) whereby these may contribute towards a beneficial LPL genotype in black populations remain to be determined. Allele frequencies of the -482C>T polymorphism of the ApoCIII and associations with insulin, glucose and triglyceride concentrations vary considerably among ethnic groups. Whilst the results are consistent in whites across different studies, the relationships in people of African origin and South Asians differ. Guidelines for anti-hypertensive treatment, which are made on the basis of CHD risk alone, will result in an under-treatment of some ethnic minority groups, particularly those of African origin. This may have a negative impact on overall cardiovascular outcomes. Primary care doctors may consider treating people of African or South Asian origin with mild hypertension using a lower threshold of CHD risk than indicated in the hypertension guidelines. Overweight and central adiposity are important determinants of blood pressure ‘within’ populations of different ethnic origin but do not explain the differences in blood pressure ‘between’ co-resident ethnic groups. The strength of the relationship is attenuated in ethnic minorities, particularly in women. The present study confirms early reports of an independent association between increased proximal sodium reabsorption, insulin levels and metabolic abnormalities in white men and women. These relationships, however, are not present in other ethnic groups with overt hyperinsulinaemia and metabolic abnormalities suggestive of insulin resistance. 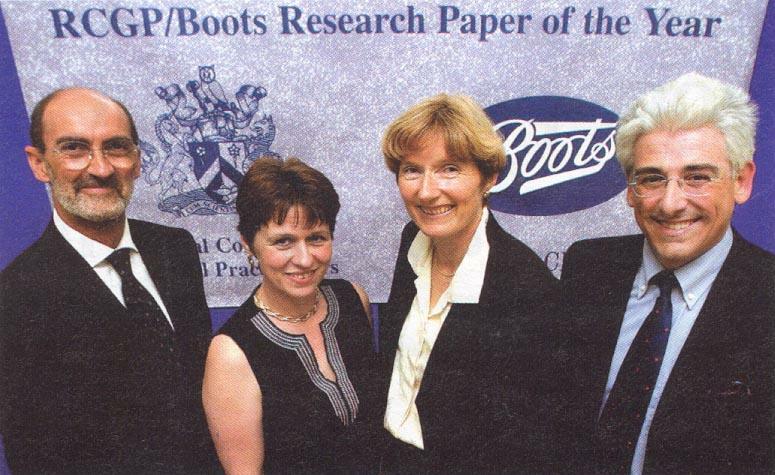 The Research Paper of the Year Award has been running since 1996 and is generously supported by Boots The Chemist. Its purpose is to raise the profile of research in general practice and to give recognition to an individual, or group of researchers, who have undertaken and published an exceptional piece of research relating to general practice. The paper demonstrated the difficulties of applying the Framingham risk assessment for ten-year coronary risk across different ethnic populations.